I continue to be on a wave concerning finding a different way of being. Recently, I got lost on the Internet and ended up on a website that sells rocks and crystals from China. I was particularly struck with their bloodstones. So, I ordered 100 pieces as a test to see if I could complete the sell and there was a knowing that this needed to be here. As I reflect on it, I realize that I did not know what "this" was when I ordered it in May. As you will see below, there is an amazing synergy or guidance in my life. I suspect all of your's as well. Here's a sample of a necklace I made of the new stones. Though in the picture it appears as a heart shape, it is actually more of a shield design. Perfect for everyone based on what you will read below. Bloodstone, formally known as heliotrope, is a form of quartz in the chalcedony family. It is commonly green with red flecks. 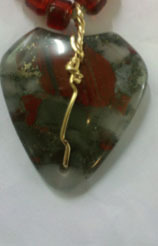 It is often confused with imperial jasper which looks very similar. 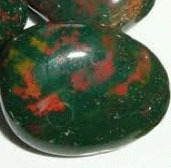 Bloodstone is colored green by iron silicate. It often includes hematite (gold-yellow inclusions) and iron oxides which provides the red spots. 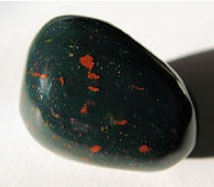 Bloodstone is related to the solstice in Greek mythology. It is often recommended for healing infections, inflammations, and poisoning by creating elixirs. 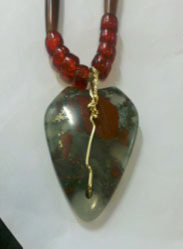 Bloodstone is an intense healing stone, often referred to as "the stone of courage". It helps to protect the wearer by limiting and fending off undesirable energies and influences. It beckons the wearer to "be here, now" so as to continually renew one's physical, emotional, and mental states. It provides support to improve one's talents and abilities as well as enhance decision-making abilities. It provides a centering and grounding energy that is conducive to balancing oneself when overcome by distress or anxiety, including the masculine and feminine energies within. Hence, it can be calming in cases of irritability, aggressiveness, and impatience. It revitalizes when one is exhausted and tired. It stimulates dreams. There is an inherent strength within Bloodstone. It helps to adjust quickly to unexpected occurrences that tend to undermine our sense of control. Hence, it can dispel bewilderment and obscure thoughts. Moreover, it can support our capacity to find harmony, adaptability, and strength in any situation. It supports one's self esteem by supporting a grounded or centered sense of confidence. It inspires an awareness of prosperity. It engenders a strong feeling and sense of gratitude that it is all right to have what one wants and has earned. It provides a positive orientation and regard for life's abundance. Physically it is an immune boosting mineral in cases of acute infections. It stimulates the lymph glands and metabolic processes, thereby reducing and clearing pus, toxins, and acidity. Judithann H. David & JP Van Hulle, Michael's Genstone Dictionary, 1990.